Well we were patient, waiting for the novelization of Star Wars: The Last Jedi to release, and it is finally here! The audiobook is eleven hours of content but this “expanded edition” has a bunch of new content! By the way, there is no such thing as the un-expanded version. The publishers are just using that term to explain that there is fresh content in the novel. 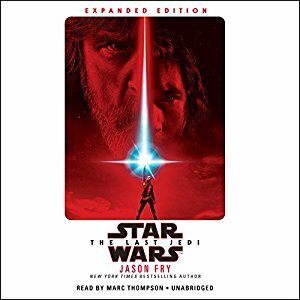 Marc Thompson is our narrator for this audiobook and he has adjusted his performance to show the change in the age of Luke and Leia. This adjustment was not as prominent in the novelization of The Force Awakens, from what I can remember. I had a brief conversation with Marc. He continues to express incredible humility and excitement about getting the call to perform his favorite characters in any genre. For us audiobook fans, there is an easter egg hidden in The Last Jedi just for us. Within the Canto Bight scene one of our heroes bumps into someone in the casino. That character is none other than Lexo Sooger, the main protagonist in the short story that Marc Thompson narrated in the Canto Bight novel. You hear his voice for one quick second but Lexo is there. The new content is pretty insightful. Any listener to Legends Library knows that I really like Rose. There seems to be special attention given to Paige and Rose, before Paige sacrifices herself for the Resistance cause. These new scenes add to the depth and motivation of Rose. The Solo funeral is another scene I found particularly enilghtening. There is a line about how much Han would have hated all the attention. So true, so appropriate. There is still not a lot of new musical content in these audiobook productions. I don’t know about you all but I can’t get enough of that Resistance theme! I wish there was more new music in these audiobooks. This is the best novelization of a Star Wars movie since the Episode III story, written by Matthew Stover. I would love for future movie adaptations to take the same approach. Thankfully we only have a couple months to find out what the next book will be like with…..Solo!